For over 20 years, world-renowned researcher Russell Jaffe MD, PhD, CCN and his team have offered this outstanding program to help people progress to sustainable optimal health. Health is a matter of balance. Our bodies need to balance acid and alkaline properties in our cells: more acid cells leads to loss of cell resilience and increased illness. The Alkaline Way helps you choose foods and activities that will tip the scale toward a healthier and more alkaline state. 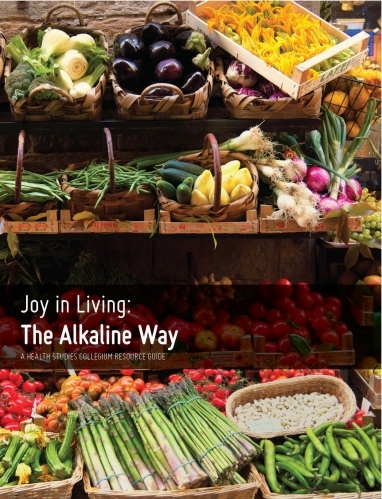 There are seven fundamental principles behind the Alkaline Way. In addition to eating predominantly alkaline-forming foods, the Alkaline Way helps you choose high-quality, nutrient-dense foods that don't provoke an immune reaction in your body. Enjoy a wide selection of delicious, alkaline recipes for healthier breakfasts, lunches, dinners and snacks. Recipes include how to make ghee, nut milks and healthier smoothies. In addition to eating an immune-tolerant, alkaline-forming diet there are critical nutrients that only supplements can provide. Learn which five supplements provide a strong foundation for acid-alkaline balance. Learn about hidden allergies and how a simple blood test, called the hsLRA (high-sensitivity lymphocyte response assay), can identify items that are burdening your immune system and blocking your path to optimal health. Inertia, tension and stress are just a few of the sources of additional acid residue that deplete our bodies of essential nutrients. Try stress-busting lifestyle practices to steady the mind and fuel positive, peace-restoring, vitality-promoting results. Detoxification is a natural process to eliminate toxins from our bodies, but the toxic burden of modern life makes it critical that we actively support this process. Use the simple but powerful Alkaline Way tools to help you effectively rid your body of toxic baggage. A simple and inexpensive morning pH test can reveal a lot about your acid-alkaline balance and your mineral reserves. The Alkaline Way explains how to do this simple test at home to learn this critical information.